I get questions all the time about how I stay fit with two little boys and a semi-full time job. And the honest truth is that a lot of the time I don’t. I’ve mentioned before here on the blog that I try really hard to just be a mom during the day, so that leaves me with the night time as my only option for blog work. It’s long days, late nights, and occasional survival mode. BUT, there are a few things that work for us and that I try to do consistently to keep myself at least somewhat healthy when I’m so busy. Maybe one or two of them will work for you too — even if you aren’t a working mom, or even a mom! 1. Choose healthy activities you like to do. For most people, exercising isn’t all that fun. You probably feel good afterward, but the actual exercising part is not so fun. I dread the burn and the exhaustion, and have a hard time pushing myself. So I try to choose exercises I enjoy doing so I stay motivated, and try to mix things up so I don’t get bored. I switch off between at home videos, running outside with our Bugaboo Runner, swimming, or walking. 2. Be flexible with what exercise methods work at the moment. During the school year I had a gym membership and was going consistently while B was in school every morning. Now that he’s out of school for the summer, the gym just doesn’t work as well so I’m doing at home exercises and using our new Bugaboo Runner to take the kids out in the mornings or evenings. The Bugaboo Runner was just released and they sent us one to try out. We love the Bugaboo Donkey, so we were super excited to try out the Runner this summer, especially since it fit perfectly with our non-gym-going schedule. The wheels are super sturdy, the stroller is so lightweight, it fits with any of the other Bugaboo seats , and it runs like a dream. Plus I love that you can have your child face forward or backward! The only downside for me is that the front wheel doesn’t turn so you have to lift up the front wheel to turn, but it’s not a huge deal. 3. Help your kids be active and healthy. I think it’s really important to instill good habits in your children by setting an example early on in their lives. And if you’re trying to be a good example, you’re more motivated to keep yourself healthy. My kids love trying to do at home exercises with me, eating the foods that I eat, going to the gym (even though they just go to the daycare), or running alongside our Bugaboo Runner stroller when I run. 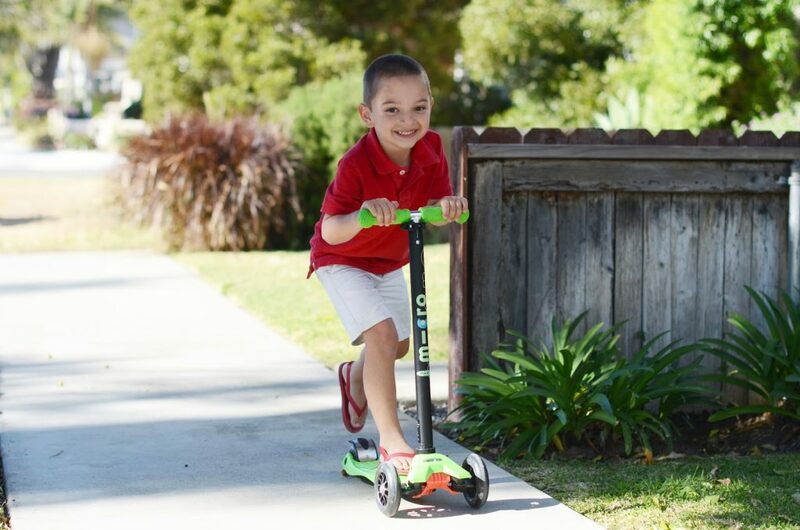 We also take a lot of family walks (with them riding on their scooters), so they appreciate simple outdoor activities that keep them fit and healthy. 4. Develop healthy eating habits. I’m totally a creature of habit when it comes to eating, and I don’t mind eating the same thing every day. So if you need variety in your meals, this is probably not the best tip for you. Every day I make a green smoothie for breakfast (recipe here), and every day for lunch I make a vegetable wrap (sun dried tomato tortilla, thin layer of hummus, shredded mozzarella, chopped cucumber, spinach, tomatoes, pepperocini’s, and a little drizzle of salsa). 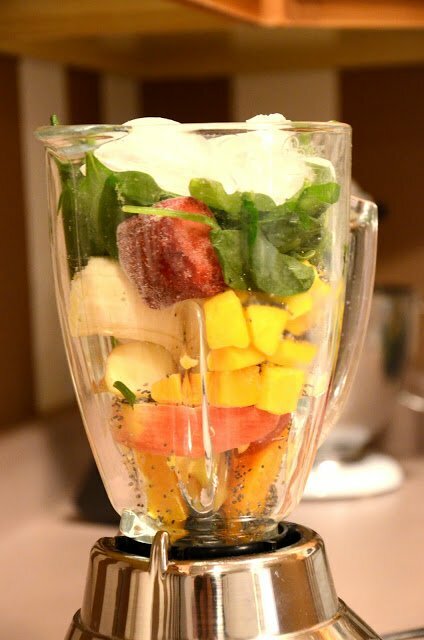 They get me tons of fruits and veggies early on in the day, they taste amazing, and they’re both very filling. 5. Make time for yourself. Emotional and mental health is just as important as physical health. Taking time just for you, especially when you’re a busy mom, is crucial to your happiness and sanity. Go treat yourself to a pedicure while your husband stays with the kids. Don’t miss girls nights with your friends. Watch your favorite movie or TV show during nap time. Or just take a nap in the afternoon when your kids are napping. Whatever makes you happy, make time for it! What do you do to stay healthy in your busy life? I’m always looking for good advice! Looks like a good stroller. Too bad the front wheel doesn’t turn. I really agree about the “me” time I cherish it nap time is my time to get stuff done. You have such an awesome stroller!!! I love these tips! We’ve been trying to instill the same habits in our kids lately with nightly walks and jogging with them in the stroller! I’m going to have to try your lunchtime wrap because it sounds delicious! As an avid runner, I’ll tell you why the front wheel doesn’t turn–it’s so you can actually run with the stroller. With a swivel front wheel on a jogging stroller, anything above a slow jog becomes pretty impossible because the front wheel and thus the stroller shakes so much. 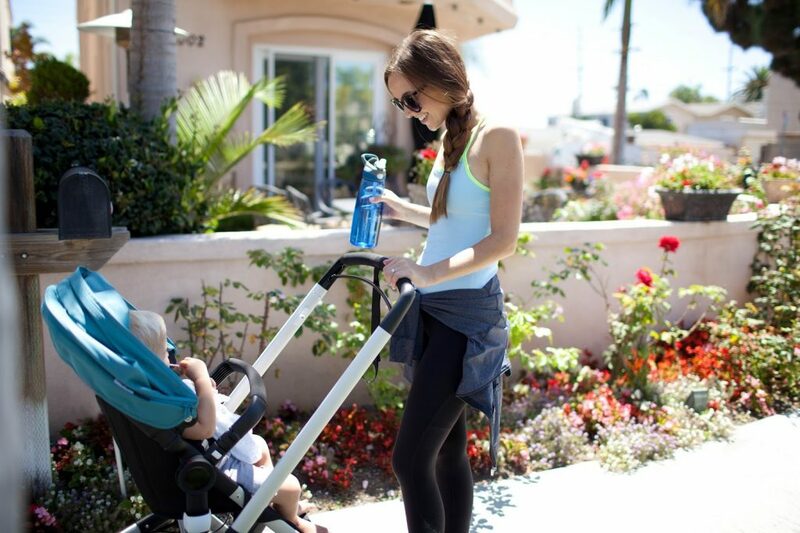 The fixed front also allows you to push the stroller with one hand while running or not push it at all. I have a BOB iron man with a fixed front wheel and can actually just push it head of me and then run to catch up with it so I don’t have to have hands on it all the time. omg I’m so having that wrap for lunch tomorrow!